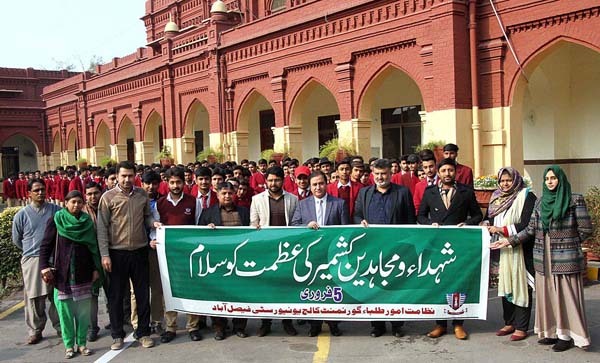 FAISALABAD, Feb 05 (APP)::The Government College University Faisalabad (GCUF) will arrange a walk and seminar on Monday to mark the Kashmir Solidarity Day. Vice Chancellor GCUF Prof Dr Nasir Ameen led the walk which started from the VC Complex and the participants holding banners and placards marched on various roads of the university. Later, a seminar was also arranged in the GCUF where the vice chancellor chaired the event.